Summer refuses to get here any faster (annoying, I know), so I've decided to fully embrace this weird in-between weather where it's not exactly freezing out, but I'm also not hanging out on my best friend's awesome rooftop drinking rosé yet either (again, annoying). This is about the time my shopping priorities usually shift toward layering, meaning I'm on the hunt for ideal third pieces. A leather jacket, skinny jeans, and a T-shirt is pretty much the L.A. girl's uniform year-round. However, in spring, it's a lifesaver for making any daytime outfit instantly evening appropriate. I love this unexpected version of a tuxedo blazer. It would be so chic with this particular pair of ultra-dark straight jeans, don't you think? Dark denim is a major trend for spring, and I recommend starting with this. A classic black blazer is a must in any wardrobe (not to state the obvious), but lately I've been into modern iterations that feature just a single button for my everyday looks. This slightly longer military-style jacket has all of the coolest details: stripes, zippers, gold buttons, and pockets. And should you desire to give your everyday black leather jacket a much-deserved break, this powder-blue suede one should do the trick. 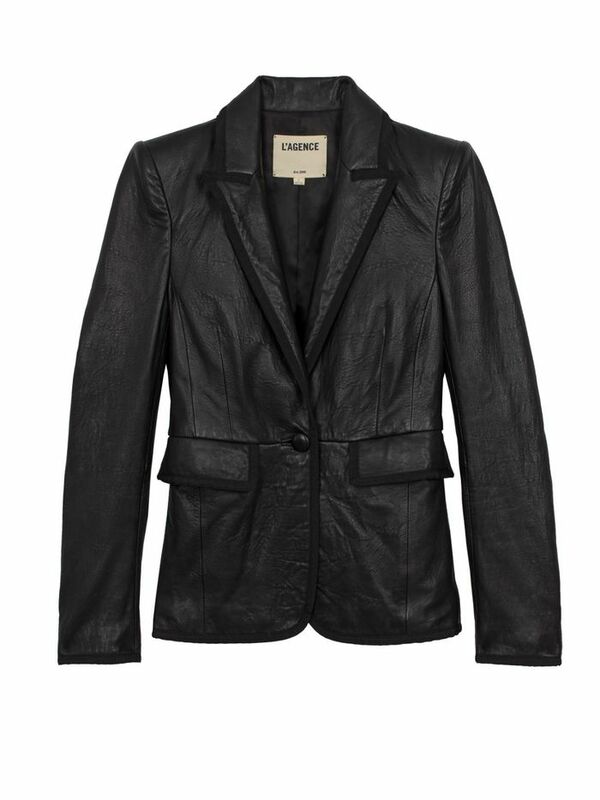 Another black blazer I'm eyeing that I'd argue is anything but "basic." This blazer only looks like denim; it's actually a really chic tweed material. The rough hem and soft color are a welcome juxtaposition on this fun denim jacket I can't wait to wear over a maxi dress. If you're thinking But that's a wrap dress, you're right—but it's also a really chic duster when worn open.